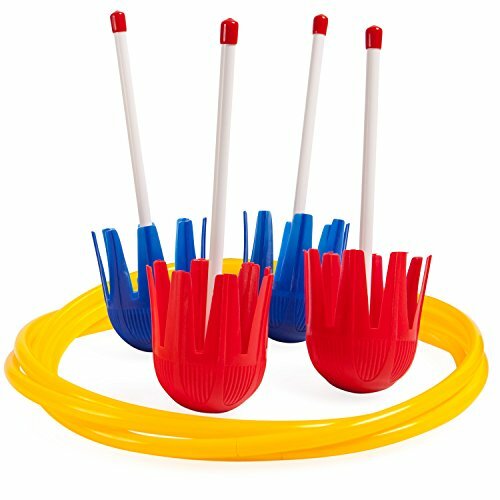 The Champion Sports Lawn Darts Set includes everything you need to enjoy one of the best outdoor games. With 4 darts in two different colors for competitive play and 2 plastic target rings, just pull it out of the box and you’re ready to play. Our child-safe darts make backyard injuries a thing of the past. Made of soft plastic, our toss game is completely safe for children of all ages, even toddlers or preschoolers. Enjoy the fun and competition of traditional laws darts without having to worry about anyone getting hurt. Let the good times roll. Our toss game makes a great birthday party activity for kids or teenagers. Grown ups love the game, too, so bring it out at an adults-only party or cookout to amp up the fun. The lawn game is perfect for all kinds of spring and summer celebrations, including graduations, Memorial Day and July 4th. Practice your aim at home or on the go. Entertain your guests at barbecues, cookouts, bonfires or pool parties. Bring the set to the lake or the beach, pack it in the car for summer camping trips, leave a set at grandma’s house to keep the kids occupied, or bring it to a sporting event for some tailgating fun. Unlike traditional lawn darts, ours are safe to use indoors. Let the kids get some energy out on a cold or rainy day without worrying about destroying the house. The target toss set is also popular for schools, recreation centers and phys ed classes to help students improve hand-eye coordination while having some fun.